atlas exécuté d'après nature au microscope-daguerréotype. Paris : J.-B. Bailliére, 1845. Description : -30 p., [20 l.] pl. ; ill.: 20 leaves of photo.s ; 43 cm. Photographs : 20 engravings with 80 images in sets of four. Subject : Cytology — Photomicrography. Atlas issued in four fascicles, the first fascicle having 5 plates. Text volume published 1844 (Paris, J.-B. Bailliére; 10308761200). Author caption: "Par/ Al. Donné/ docteur en médecine, ex-chef de Clinique de la Faculté de Paris/ professeur particulieur de microscopie, etc." Author caption: "et/ Léon Foucault." German text edition published 1846 (Erlangen, Enke; 10902751400). German text volume title: Die Microscopie als Hilfswissenschaft der Medicin; microscopische Anatomie und Physiologie der thierischen Flüssigkeiten. Reference: Donné & Foucault, (1845) Description du microscope photo-électrique. Paris: Mme. Ve. Bouchard-Huzard. Reference: Donné (1840) translated and annotated Macédoine Melloni (1801-1853), Rapport sur le daguerréotype etc. Paris: Ve le Normant. Legacy: Donné discovered blood platelets (GM 864) and was the "first to describe living organisms in pathological conditions, as observed by modern methods." (GM 5207). Eponym: Donné's corpuscles – Fat cells in colostrum. Eponym: Donné's pus test – Chemical test for determining the cause of opacity in urine. The atlas includes the first engravings from photomicrographs. One is reproduced by A. Hughes, J. roy. micr. Soc., 1955, 75, 1-22 (pl IV). — Garrison & Morton 267.1. These few quotations are important enough to grant Alfred Donné a place of honor in the Aeropagus of hematology. Donné is rightly credited with the first observation of leucemia. Donné had the opportunity of observing a case of leucemia. He reports it in one of his lectures collected in his treatise on microscopy, published in 1844. — Dreyfus, Camille, (1957) Some Milestones in the History of hematology. New York: Gruñe and Stratton. Donné's book is specifically for the medical man, and covers the results which are obtained by inspecting the various body fluids; nothing is said about tissues as such, which may be a reflection of French interests of the time. — Bracegirdle, Brian (1978) A history of microtechnique : the evolution of the microtome and the development of tissue preparation. Ithaca: Cornell; p. 47. 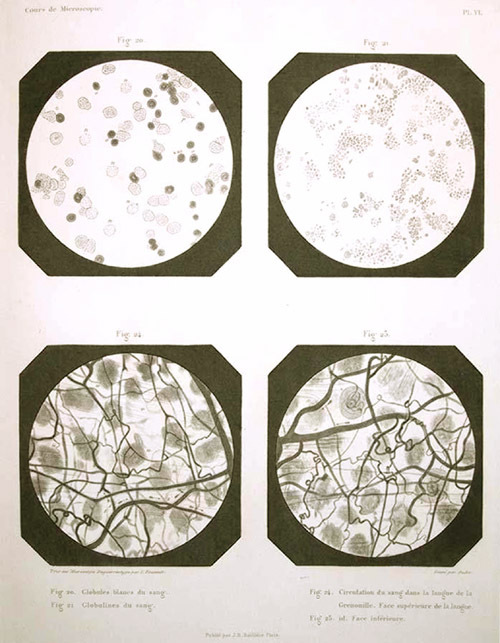 Donné therefore employed an engraver to copy the 86 micro-daguerreotypes taken by Léon Foucault, to be published in 1845 in an album (Donné and Foucault, 1845) to illustrate his "Cours de Microscopie". This is the earliest publication with illustrations copied from photographs of medical specimens. Sometimes it is incorrectly stated that illustrations are prints from the daguerreotype plates themselves, probably because Donné announced his intention of doing this. — Gernsheim, Alison Medical Photography in the Nineteenth Century. London: British Medical Association, Medical and Biological Illustration Vol. XI. No. 2. April 1961; page 86. New Haven: Yale University Press; p. 99. On 24 February 1840 Donné had the honour of presenting "microscope-daguerréotypes" to the Académie des sciences of specimens of bone tissue and objects of natural history. Donné stated that he wanted to profit from this marvellous invention, which would allow the objects to be "produced with a rigorous truth, unknown until now with the introduction of the medium of photography." — Thomas, Ann (1997) Beauty of Another Order: Photography in Science. New Haven: Yale University Press; p. 99. Used as we are to the easy projection of images during lectures, the photoelectric microscope may seem a cumbersome device, but 'the results caused quite a stir', according to a contemporary encyclopedia, and it was an important enough invention to figure on Foucault's tombstone. — Tobin, William, (2003) The Life and Science of Léon Foucault: The Man who Proved the Earth Rotates. Cambridge: Cambridge University Press; p. 59.